Follow up from Cabinet Secretary. 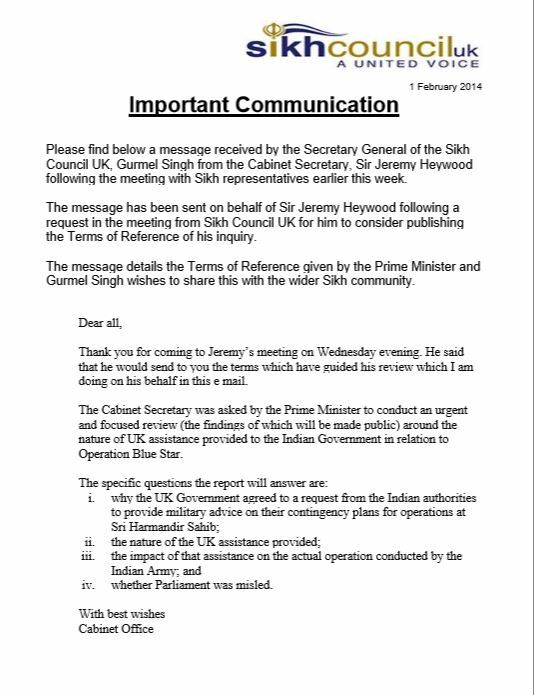 Please find below a message received by the Secretary General of the Sikh Council UK, Gurmel Singh from the Cabinet Secretary, Sir Jeremy Heywood following the meeting with Sikh representatives earlier this week. The message has been sent on behalf of Sir Jeremy Heywood following a request in the meeting from Sikh Council UK for him to consider publishing the Terms of Reference of his inquiry. The message details the Terms of Reference given by the Prime Minister and Gurmel Singh wishes to share this with the wider Sikh community. The Cabinet Secretary was asked by the Prime Minister to conduct an urgent and focused review (the findings of which will be made public) around the nature of UK assistance provided to the Indian Government in relation to Operation Blue Star.Thank you for coming to Jeremy’s meeting on Wednesday evening. He said that he would send to you the terms which have guided his review which I am doing on his behalf in this e mail. (iv) whether Parliament was misled.